7 December 2010: The aims of the international World Mayor Project, launched by the urban affairs think tank The City Mayors Foundation in January 2004, are twofold. First, City Mayors seeks to raise the profile of mayors worldwide by honouring those who have served their communities well, governed openly and honestly, as well as making significant contributions to cities nationally and internationally. The second objective of City Mayors is to involve as many people as possible from all parts of the world. From the outset, the World Mayor Project was set up to commend mayors chosen by a large international audience rather than acclamation by a panel of peers. Participants in the contest are invited to nominate and vote for city leaders who demonstrate pre-eminence in qualities such as honest and open governance, leadership and vision, management abilities, social and economic awareness, ability to provide security and to protect the environment, in addition to displaying the will and ability to foster amity among communities of different cultural, racial and social backgrounds. 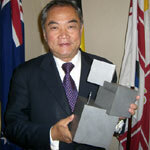 The most outstanding mayor is presented with the World Mayor Award, designed by Manuel Ferrari. The 2010 winner of the Award is Marcelo Ebrard, Mayor of Mexico City. 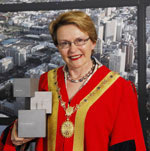 In 2008 the Award went to Helen Zille, Mayor of Cape Town. Previous recipients were Edi Rama, Mayor of Tirana (2004), Dora Bakoyannis, Mayor of Athens (2005), and John So, Mayor of Melbourne (2006). The 2010 runners-up are Mick Cornett, Mayor of Oklahoma City (US) and Domenico Lucano, Mayor of Riace (Italy). The World Mayor Project and The City Mayors Foundation have no connection with any city or organisation and are run on strictly non-commercial lines. Sponsorships, advertising, subscriptions, donations or any other kind of revenues are not sought, and if offered, are rejected. The 2010 World Mayor Project was conducted over the course of 18 months, starting in spring 2009. During 2009 and early 2010 the project organisers, The City Mayors Foundation, invited a global audience to submit nominations of mayors deemed worthy of being numbered among the most outstanding city leaders in the world. More than 118,000 individuals nominated a total of 840 mayors for the 2010 World Mayor Prize. Some mayors received thousands of nominations while others collected a mere handful. The organisers considered only those nominations that were accompanied by supporting testimonials. Based on the number of nominations and the persuasiveness of supporting statements, City Mayors drew up a shortlist of 25 finalists, which included two mayors from Australasia, six from Asia, eight from The Americas and nine from Europe. Some of the finalists for the 2010 World Mayor Prize came from the world’s largest and best-known cities, while others represented smaller communities. Most of the finalists were short-listed for the first time. Under the World Mayor rules, winners and runners-up from previous years were not eligible. During the second round of World Mayor 2010, from June to 22 September 2010, people were invited to select from the shortlist of 25 their choice of title candidate. In order to have their votes registered, participants had to provide a reasoned comment. More than 320,000 people worldwide participated in the second round of World Mayor 2010. When setting up the rules for the project, City Mayors emphasised that the strength of argument expressed in supporting statements carried more weight than the number of votes. By stressing the significance of well-argued comments, the organisers aimed to ensure that contest participants thought carefully about the merits of their chosen mayors. Publication of some of the comments on the World Mayor website also enabled comparison. These rules furthermore allowed mayors from smaller cities to compete on equal terms with those from large metropolises. As indicated, some 322,000 people from all parts of the world took part in the second round of World Mayor 2010. With a share of 30 per cent, Latin America contributed the largest number of votes, an increase of three percentage points compared with 2008. Tens of thousands of voters supported both the mayors from Mexico City and Caracas. The rise of votes from the US and Canada, up from 18 per cent in 2008 to 20 per cent in 2010, was largely due to the number of four nationally prominent candidates on the shortlist. Asia contributed the second-largest share of votes. Unfortunately, however, the two Asian mayors with the largest number of votes could not be considered for the 2010 World Mayor Prize. Syed Mustafa Kamal, former Mayor of Karachi, had to step down because of Pakistan’s local election laws. Jesse Robredo, former mayor of Naga City, was appointed to the national cabinet of the Philippines as Secretary of the Interior and Local Government. Mayors to be eligible for the 2010 World Mayor Prize had to be in office on 22 September, the closing date for public voting. The number of votes from Australasia went largely to the mayors of Brisbane (Australia) and New Plymouth (New Zealand). Support for New Plymouth’s Peter Tennent waned in the second half of the voting period owing to the mayor’s decision not to contest the October 2010 mayoral elections. With no African candidate on the 2010 World Mayor shortlist, voting from Africa dropped sharply. While in 2008 Africa’s share of the vote stood at 11 per cent, it amounted to a mere three per cent in 2010. With no mayor from any of Europe’s capital cities on the 2010 shortlist, the continent’s share of the number of votes fell from 23 per cent in 2008 to 19 per cent two years later. In October 2010 the editors of The City Mayors Foundation decided on a list of ten mayors who stood out in terms of numbers of votes and quality of comment from their supporters. While the total numbers of votes cast for the mayors in the top ten exceeded 170,000, the number of votes received by individual mayors did not have a significant bearing on the decisions of the judging panel of editors. The panel was primarily influenced by the arguments and persuasiveness of testimonials bestowed on mayors. As some city leaders in the top ten represent cities of several million people while others are mayors of much smaller towns  the Mayor of Riace represents a community of some 1,700 people - the City Mayors panel of editors was of the opinion that basing judgment on numbers alone would unfairly disadvantage mayors from smaller towns. The editors of City Mayors are also very much aware that an outstanding mayor from a city in the developing world requires different qualities from one in Western Europe or North America. The winner of the annual World Mayor Award will therefore never be described in terms such as ‘the world’s best mayor’. The top three ranked mayors Marcelo Ebrard (Mexico City), Mick Cornett (Oklahoma City) and Domenico Lucano (Riace) were the editors’ unanimous choice. French artist Manuel Ferrari designed the World Mayor Prize sculpture in 2004. The City Mayors Foundation invited the artist to create a sculpture that was as unique as the city of the winning mayor. The chosen design of three interlocking cubes emphasises the need of growing cities to be built on strong foundations. A slim, upward-looking figure symbolises all those who enter cities to realise their ambitions. Mayors to be considered for the 2010 World Mayor Award were required to be in office on 22 September 2010, the closing date of public participation. The following finalists resigned prior to that date for various reasons: Syed Mustafa Kamal (Karachi, Pakistan), Jesse M Robredo (Naga City, Philippines), Beto Richi (Curitiba, Brazil), Ole von Beust (Hamburg, Germany).